For the past seven years the Mishras have packed their bags and set off on an annual pilgrimage from their home in Indiana to Washington DC, to watch their children participate in the top US spelling championship. Elder daughter, Shruti, was first in the family to participate in the contest, but it was her 13-year-old brother, Sameer, who spelled his way to the coveted first prize - worth more than $40,000 - in this year's National Spelling Bee. The spelling contest is a big event in the US. Children study hard for months and have to get through regional contests to make the final. Children of South Asian origin dominated the top 10 spots in the gruelling competition this year. The second prize was bagged by Sidharth Chand, 12, of Bloomfield Hills, Michigan, while Kavya Shivashankar, 12, of Olathe, Kansas, tied for fourth place, and Jahnavi Iyer, 14, of Enola, Pennsylvania, tied for eighth. 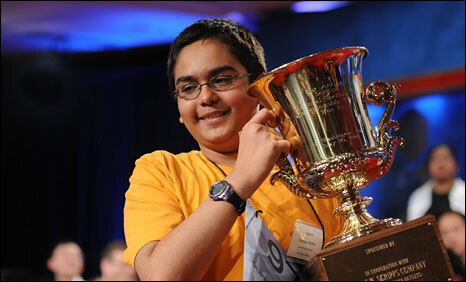 On top of that - eight-year-old Sriram Hathwar of New York made history by becoming the youngest contestant. Over the years many children of South Asian origin have left their mark at the spelling event, but why do they dominate it? Chicago-based Dr Balu Natarajan, who won the Spelling Bee in 1985 and was a judge at this year's contest, says there is one common thread among nearly all winners regardless of ethnic background - extensive involvement and support from family. His parents helped him by finding word lists, looking up definitions and pronunciations and quizzing him on them. They even took days off work in order to help him prepare. The Mishras moved to the United States from Delhi 15 years ago. 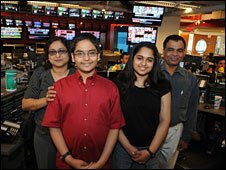 Daughter Shruti's success in a math contest won her scholarships at top universities. 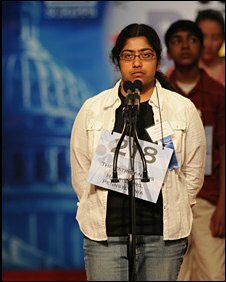 Krishna Mishra, who teaches microbiology at Ivy Tech Community College in Lafayette, Indiana, said his wife, Alka, encouraged Sameer to participate in the Spelling Bee because she felt he too could win a scholarship to ease the burden of his tuition. Mr Mishra says the Spelling Bee has been a good educational experience for his children and a great way for them to learn English. Over the past year Sameer practised "dictionary reduction". He split the third edition of Webster's Dictionary into 26 books - one for each letter - and would spend his days learning the words. 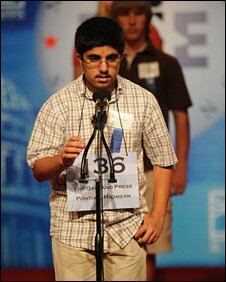 The Spelling Bee provides contestants with a list of 45,000 words, which Sameer didn't include in his books because, his father says proudly, "he knows them all". Besides the prospects of a scholarship, Mr Mishra says his wife, who teaches anatomy and physiology at Ivy Tech Community College, was attracted by the lure of the red carpet laid out for the finalists and their parents. "In this country being on the red carpet is like being a celebrity. She wanted Sameer to take us on that red carpet, just like the celebrities," he said, laughing. Sameer Mishra credits his sister for being his "coach and inspiration" and his parents for providing emotional support. He won the contest by correctly spelling "guerdon", which means a reward. Sameer admits investing a lot of hard work in the year before the contest. "I enjoy reading books and playing video games but had to do less of that because of the time I needed to put into studying for the Bee," he said. But for Sameer the investment has been "very worthwhile". "I have learned to work hard and persevere," he said. What advice does he have for future spellers? "Keep working hard. Even if you don't win you will always learn something new." Dr Natarajan says what spellers take back from such contests depends on the child. "I did not know the meaning of every word I was asked to spell," he admitted. "But based on my observations of many spellers during recent years, I am convinced that many of them have studied the meanings of the words." He says he was struck by the fact that many of the participants were able to approach the words by asking if they contained specific root words from various other languages, suggesting that they were well-versed in etymology, not just rote spelling. Inspired by the success of South Asians in spelling contests, Rahul Walia, CEO of New Jersey-based Touchdown Media, set up the South Asian Spelling Bee. "We wanted to give South Asians a platform within the community to excel," explained Mr Walia. The first contest will be held later this month in New Jersey and Washington DC. Mr Walia attributes the success of South Asian spellers to their roots. "Our parents tend to be more focused on a child's education. Participating in such competitions is seen as an opportunity to enhance those skills," he said. He sees such contests as being not just about learning big words but getting the opportunity to gain confidence and enhance people skills. Dr Natarajan said the Spelling Bee gave him "a confidence that I could achieve things if I put my mind to it, but that failures would be needed before success". "After all," he added, "I had to compete in the National Bee in 1983 and 1984 before I could win in 1985. "These are definitely smart kids."